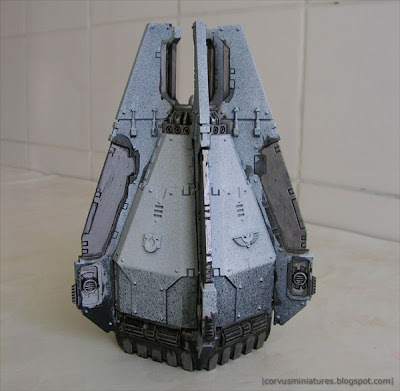 Here are some WIP shots of the Space Marine Drop Pod I'm working on. At the moment only the metallics are done. I'm quite happy how the interior looks, this was done using a simple basecoat of Chainmail, then a was with black ink and then some cleaning up with Chainmail. Other, darker parts are done using Boltgun Metal and heavier washing. I used two colours of primer on this model. First I opened the doors and sprayed the inside black. When that dried I turned it upside down and sprayed some more black on the bottom of the drop pod. Then I closed the hatches and sprayed the outside white. This will allow me to paint most of the metallics over black and blue over white. The interior also has some hard to reach places, this way I was sure everything is black so when I miss a spot with Chainmail it won't look as bad as with white primer. As suggested in this post, I expected to have a lot less painting time than a few months ago. And yes, I was right. Currently I'm not working on any big, or high quality projects. I'm mainly focusing on my Space Marine army. In the last couple of weeks I finished 8 Tactical Marines with special weapons and right now I'm working on a Drop Pod. To get more painting done I constructed a paint station out of a cardboard box. When I have some time in the evening it's very easy to take the box and sit at the living room table or in front of the TV and do some work on the Space Marines. When I'm done I can close the box and put it safely away from little toddler's hands. 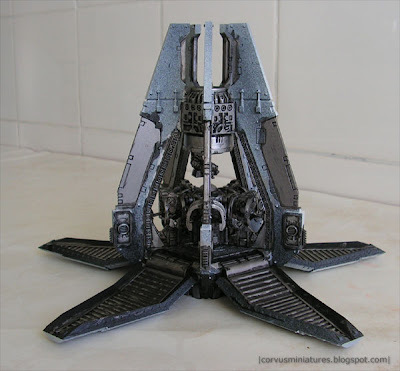 I will post some pictures of the paint station, as well as the Space Marines very soon.